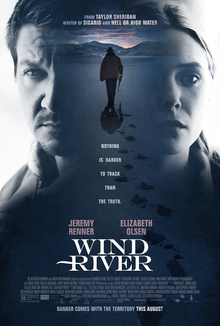 In Wind River, the directorial debut of Taylor Sheridan, writer of Sicario and Hell or High Water, an FBI agent (Elizabeth Olsen) teams with a town’s veteran game tracker (Jeremy Renner) to investigate a murder that occurred on a Native American reservation. Both the past films written by Sheridan did not fail to impress me, as both were masterfully written and very engaging. Wind River sees Sheridan in the director’s chair and he delivers yet another excellent screenplay, this time set in a snowy reservation in Wyoming. Sheridan develops his settings and main characters very well in all three of his scripts, and here it doesn’t fail as well. 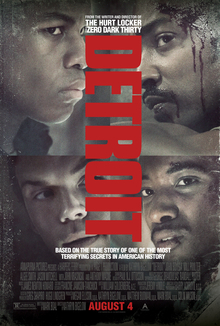 Jeremy Renner delivers one of his best performances as the main character, who has a tragic past and an estranged family, and you feel for the emotion Renner provides in every scene, and his character is superbly written. As much as I love him as Hawkeye in the Marvel universe, his best roles are the ones in smaller films, those that go into emotional depth, even like in last year’s Arrival. This is definitely up there with his performances in Kathryn Bigelow’s Oscar winner The Hurt Locker and Ben Affleck’s heist thriller The Town as one of his greatest roles. Elizabeth Olsen has a few good moments in the film, but it mostly felt like she was just reading lines off a script and barely brought much depth into her character, and it was ultimately hard to care for her role. Wind River has a Coen brothers vibe to it, as it feels like it drew great inspiration from Fargo, not just the development of the cold, isolated setting but also the way tension is built so well through small scenes. For those looking for a thrilling and interesting mystery thriller to watch, you’ll definitely be entertained, although I never felt like it brought anything new to the genre. The overall structure is entertaining but also feels very familiar and it didn’t offer much that was new or ground-breaking. Although the script is overall great, I was sometimes concerned by the directing before watching the movie, as this is Sheridan’s first time directing a film. I was mostly impressed by the directing, especially for a debut, but the use of handheld cam is often too shaky and sometimes distracting. Some shots are captured very well, but during the smaller, more conversational scenes, the camerawork could have used some improvement. There wasn’t the energy to it that Sicario and Hell or High Water had, as those films had more richness in their cinematography and directing, part of what made them both better films. This film could have used some more interesting and longer shots, as well as less noticeable handheld camera to make some scenes even stronger, but I overall was very pleased by what Sheridan was able to do as a director for the first time. He didn’t offer the incredible style brought by the directors of his previous scripts, but his work is still solid and appreciable, and I was still able to really enjoy the film. I hope to see Sheridan write and direct many more films in the future. Wind River is a violent, engaging, and smart thriller with a great script and lead performance, and although the story is still somewhat familiar and the directing isn’t perfect, this is the type of film cinema should have more of to offer, and I’d definitely recommend this as a film to go watch when it’s released this August. After suffering a serious injury on the race track that could threaten to end his career, Lightning McQueen decides to give it his all and prove that he’s still the best race car out there, despite the more advanced technology in the new rookie racers around him. There have been movies that I have watched an incredible amount of times as a kid, and among that list is the original Cars. Even eleven years after I first saw it, I still see it as an inspirational and touching flick, despite the idea of all the characters being talking cars. Pixar has made what are to this day the greatest, most touching, and mature animated films. Cars 3 may not reach the heights of the first film which is such a classic to me, but it’s a huge recovery from the awfully messy and disappointing mess of Cars 2, which is by far Pixar’s worst and a huge misstep for the franchise and the studio. Thankfully Pixar has been back on its feet lately and this film feels much more like the first than the second. The events of the second film even had absolutely no impact on this movie! Cars 3 is definitely the kind of sequel this film needed since 2011. The time lapse since the first film is used to the story’s advantage, bringing more challenges that McQueen must face such as new technology and forms of racing, and tackles the themes of generation differences and retirement, things we wouldn’t get from a studio that isn’t Pixar. Cars 3 also introduces new themes to the franchise that we need from a 2017 film, such as diversity, as a new main character, Cruz Ramirez, is a female car who is determined to be a racer no matter how much other cars discourage her, and her last name also implies a foreign ethnicity for the character. She is voiced very well by Cristela Alonzo, who I hope to see in more voice roles in the future. There are also other instances in the film which female characters are mentioned not stopping at any obstacles to get what they want, which you will notice in the film. There’s also the theme of mentorship as Lightning recounts his time from the first film with Doc Hudson, and later even becomes a mentor himself. The movie knows how to pay great tribute to the late Paul Newman, the legendary actor and voice of Doc Hudson in the first film. Owen Wilson is great as always as one of the most iconic animated characters. The film begins with the famous line, “Speed. I am speed.” and Wilson still has all the energy and fun that made McQueen so great 11 years ago. The movie doesn’t make the mistake of not making him the main character again, like in Cars 2. Chris Cooper and Armie Hammer also join the cast as interesting characters, and characters such as Sally and Mater return from the previous films, but this time in much smaller roles, although we still see the support and motivation McQueen gets from his loyal friends of Radiator Springs. Ever since Inside Out was released to critical acclaim, Pixar has been on a winning streak, recovering from films that weren’t as well-received such as Brave and Monsters University, and I can’t say that Cars 3 is the one to break that streak. This movie still has plenty of heartwarming dialogue and themes, and some fun humor as well, Some of the callbacks to the original are especially entertaining. Director Brain Fee isn’t able to create sequences that are up there with the racing sequences, Lightning and Mater tipping tractors, or Doc training Lightning in the first film, or even close, but the plot is at least enjoyable and thankfully returns to the sports drama tone of the first one rather than the action spy thriller tone of the second one. Moments will have your young ones laughing and cheering, and will especially inspire younger viewers to pursue their dreams and there’s also plenty of great animation in the film, but younger ones won’t feel the intelligent spirit and heart built by the first one. It would be unfair if I just said this film isn’t great because it’s not as good as the first one, because I already knew it couldn’t and most likely wouldn’t be. However, some of the dialogue in the beginning isn’t written with much thought and feels just there to add to the film’s runtime. The first 5 minutes of the film is a quick montage of events that I think should have been stretched out to slightly longer. Although there are important events going on the dialogue did not intrigue me like it could have. Sometimes the film needed dialogue to build the rest of the scene and I don’t think those parts were handled very well. Similar literally every movie that is released nowadays, the film tries to deliver some smart lines from certain characters to inspire our leads but not every line sounds as wise as the script thinks it is. The humor is at first amusing but at one point gets too recycled and sometimes even unfunny at a few moments. Like I said before, the film delivers some poignant messages that I didn’t think an animated film like this one would handle, in a way that kids would enjoy, but once I understood the themes and messages the film was trying to convey, I immediately knew how the rest of the film would play out. It became very predictable yet somewhat heartfelt by the ending, which was fine but felt a little out of place and could have used improvement. At times the film relies on throwbacks to the first film a little too much just to carry the runtime forward, such as a scene in which Lightning and Cruz are training in a field of tractors. 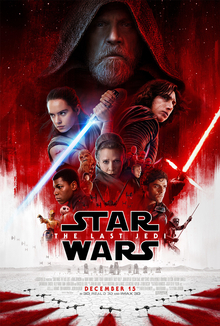 However, this did not stop me from having a fun time with this pleasing and lighthearted sequel that overall did not disappoint, and will entertain families, especially younger audiences. 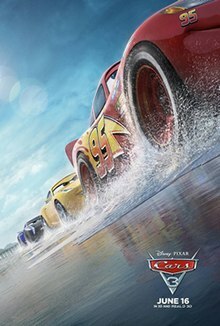 Cars 3 is a step up from the disappointing second film and a strong finale to the Cars trilogy, that fans are sure to enjoy. It has some witty themes like most Pixar films, and even though it can’t be compared to the first film, the nostalgia and empowering messages are sure to be enough to make this worth a watch and anything but underwhelming. Also, make sure to be there on time for a short film before the feature, titled Lou, which wasn’t among Pixar’s best shorts but still a very sweet story about kindness that you’ll be sure to enjoy. 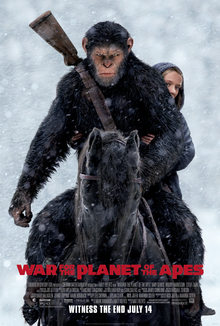 So there’s another reason to buy a ticket for this sequel that’s fueled with family-friendly humor and fun!